Last week I did a post reviewing my Origins Voxbox (read about it here). That was a jumping off point for me in trying to figure out my own skin care regimen. If you're anything like me, you have at least 10 friends that are trying to sell you Rodan + Fields. Add to that the fact that I'm no longer a baby and I sweat like a pig five days a week. So I've actually been thinking about my skin, which is weird for me. I don't want to improve it, it's pretty awesome, but I do want to keep it awesome. So I did some research and came up with my own regimen. Up until now, my regimen was a face wipe. I have friends and a sister-in-law that probably want to hurt me for that statement. While I have been blessed with my mother's genes, I also know it's time to start taking care of what God gave me. My research method was pretty simple: I used samples I had on hand. I didn't do a lot of research and I didn't buy a lot of products. There are probably plenty of products out there that are better, but these are what I tried. Remember, I'm just getting past a face wipe here! I used my Origins samples, some samples Sephora sent me and a Rodan + Fields mini facial my friend gave me at least a year ago (sorry Bridget!). It shouldn't be a ton of products. I have shoes and clothes to buy. I've tried cleansers before. And I've always been terrible at them. I've used Mary Kay before, when my mom sold it, and I've tried and really liked the Boots No. 7 line that you can find at Target and Ulta. But most cleaners aren't as easy as I would prefer (hi - I'm lazy) and they tend to leave my skin sticky feeling. Hence why the past few years I've just done face wipes. They're also a lot cheaper! I actually loved both of the cleansers that I tried and have bought both full size! I use the Frothy Face wash in the morning. I use it in the shower and then put on moisturizer. I use the makeup melt away at night to take off my makeup. Which, by the way, works like a dream. It's $34, which is steep, but it's a bigger tub so I'm hoping it lasts a while! Both routines take me less than 5 minutes, so I can deal. The Frothy Face Wash also doesn't leave my skin sticky. Win win! Whew! There were so many good moisturizers to choose from! 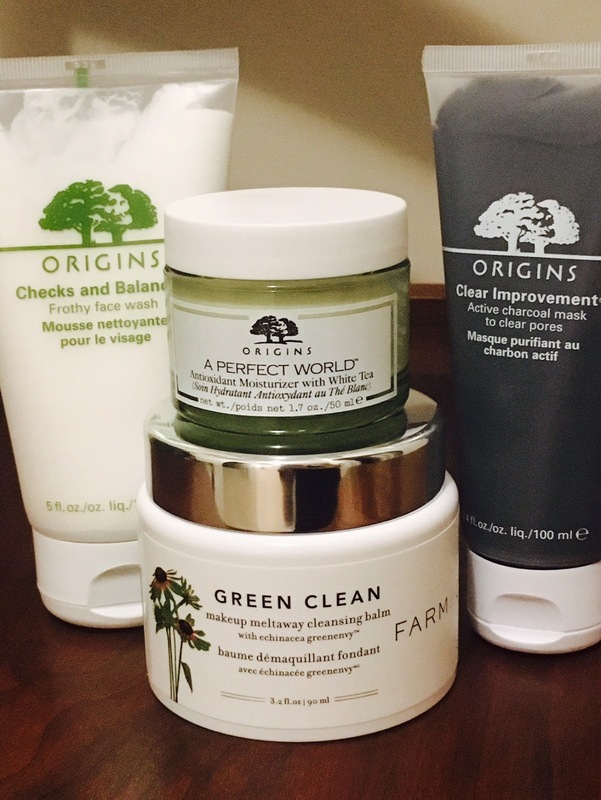 I tried the Night-a-Mins and the Ginzing Moisturizers before I attended the A Perfect World event at Origins in Southpoint Mall. I loved them both, but, let's be real. I'm not going to use a thousand products. I don't even use a thousand makeup products, I just own them. While I was at the event, I spoke with one of the sales ladies that recommended the A Perfect World moisturizer. I can use it at night or in the morning and it's great for normal skin, like mine. So I bought that one. And so far, I love it. I also love the Night-a-Mins. I've been using my sample size of that at night after I take off my make-up. It's a little heavier for night, which I like. I would honestly consider buying it for night-time use once I know that I'm going to keep up a routine. The Ginzing was great, nice and light and smelled heavenly. Like a super light citrus smell. I think it would be great during the summer or months when I don't wear as much makeup. The Rodan and Fields Night Serum was okay. I'm not a fan of serums. I feel like I need a moisturizer with them and that breaks my rules of being complicated. I'm going to be real honest: I don't get eye cream. Maybe it's because I have the face of a teenager. Maybe it's because I have deep set eyes and you don't really see them anyway. Whatever it is, eye cream seems like a waste to me. I tried both the Ginzing Refreshing Eye Cream and the Clinique Pep-start Eye Cream. I could tell a little bit of a difference in my eyes/skin under my eyes with the Clinique Pepstart Eye Cream, but I also don't know if that's because I was looking for it or because it was actually there. Here are three comparison shots. First is no eye cream, second is with the Ginzing and third is with Clinique. I honestly can't tell a difference. This one slightly goes against my "it can't be complicated" rule. But I tried out three masks. I love the charcoal mask! It doesn't peel (thank you sweet baby Jesus), but rinses off. I've been doing it after my classes on Saturday. The Original Skin mask is nice, but I don't love it as much as the charcoal mask. Plus, I tried it during a mini facial and they used a bunch of other products with it. Daunting. Finally, the Microderm Abrasion from R+F. I liked it. I did. But I'm going to be totally real and say that R+F is outside of my price range. Maybe later when I'm trying to reverse aging and all that. Maybe if I had skin care issues. But now? Nah. Like I said earlier - I have shoes and clothes to buy. And a new car. It's still pretty basic. It's definitely more expensive than face wipes once a day, but I can already tell that my skin is happier. I have less bumps and red areas on my face. Like I said, I don't need much. But I feel like I've grown up a little today. I have a skin care regimen. Like an adult. Woo! What's your skin care regimen? What are your favorite skin care products?